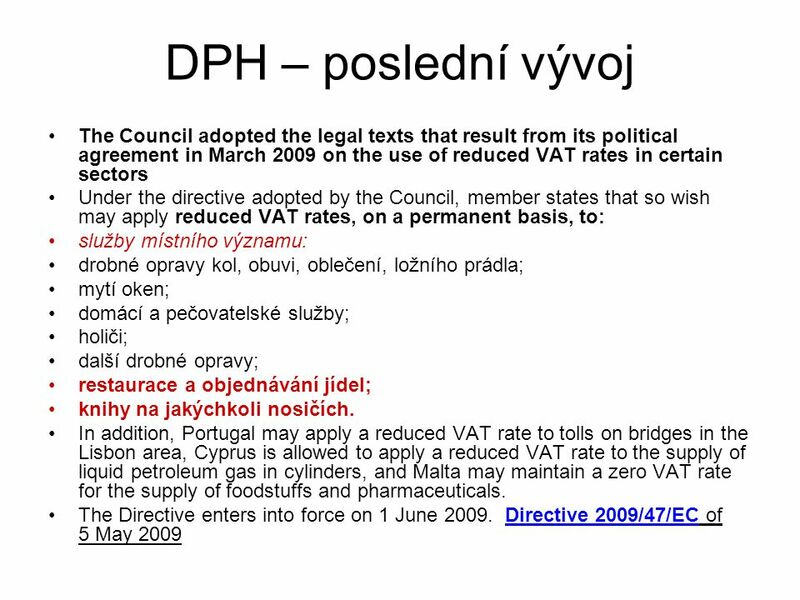 How VAT is charged? VAT is charged at every stage of sale where the cost of an item is increased. The standard rate of VAT is 21%. 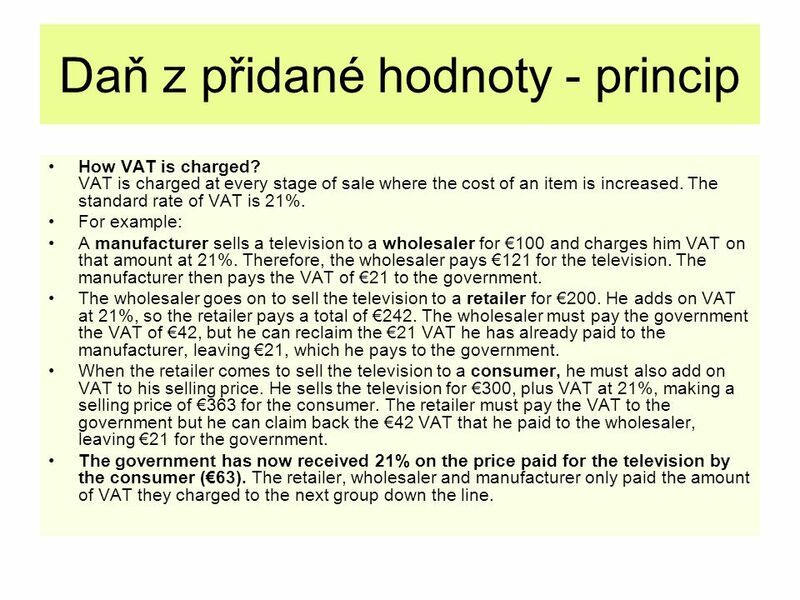 For example: A manufacturer sells a television to a wholesaler for €100 and charges him VAT on that amount at 21%. Therefore, the wholesaler pays €121 for the television. The manufacturer then pays the VAT of €21 to the government. The wholesaler goes on to sell the television to a retailer for €200. He adds on VAT at 21%, so the retailer pays a total of €242. The wholesaler must pay the government the VAT of €42, but he can reclaim the €21 VAT he has already paid to the manufacturer, leaving €21, which he pays to the government. When the retailer comes to sell the television to a consumer, he must also add on VAT to his selling price. He sells the television for €300, plus VAT at 21%, making a selling price of €363 for the consumer. The retailer must pay the VAT to the government but he can claim back the €42 VAT that he paid to the wholesaler, leaving €21 for the government. The government has now received 21% on the price paid for the television by the consumer (€63). The retailer, wholesaler and manufacturer only paid the amount of VAT they charged to the next group down the line. 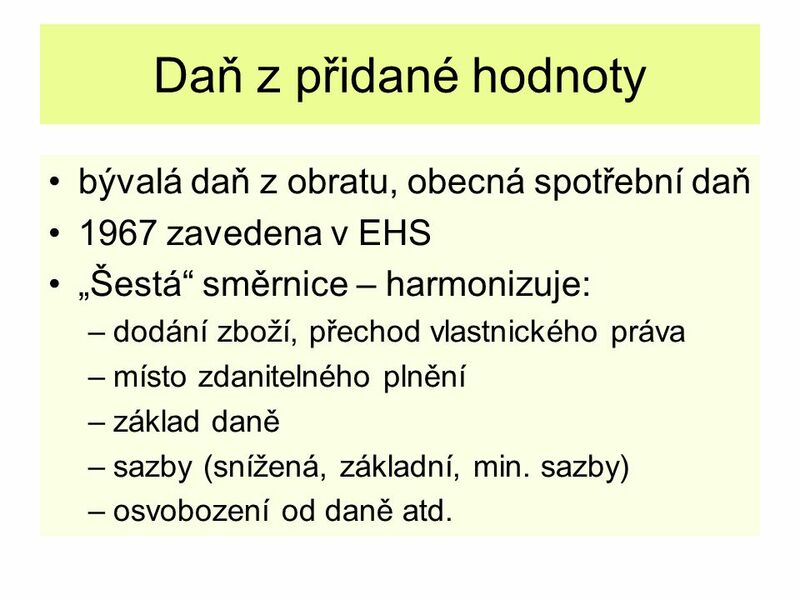 1967 zavedena v EHS „Šestá“ směrnice – harmonizuje: dodání zboží, přechod vlastnického práva místo zdanitelného plnění základ daně sazby (snížená, základní, min. 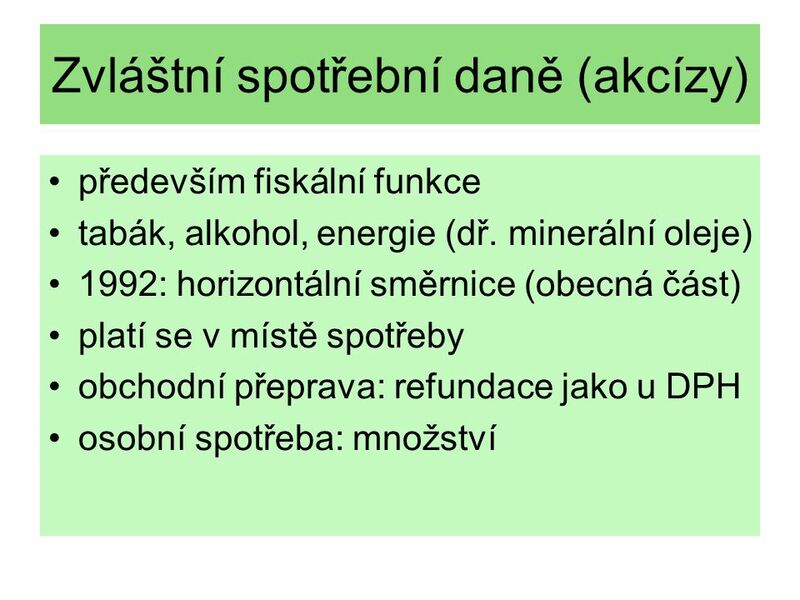 sazby) osvobození od daně atd. VAT on imports If you buy online or by mail order etc. From outside the EU You can buy goods from outside the EU up to a value of €22 without incurring any VAT charges. Goods up to a value of €150 may be imported without payment of Customs Duty. 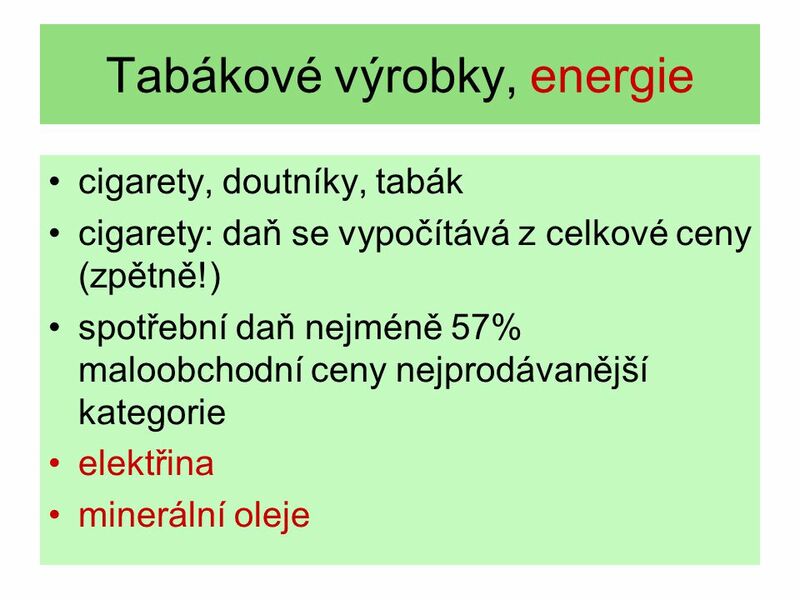 However, VAT and import duty is charged on importations of tobacco, tobacco products, alcoholic product and perfumes even if they cost less than €22. 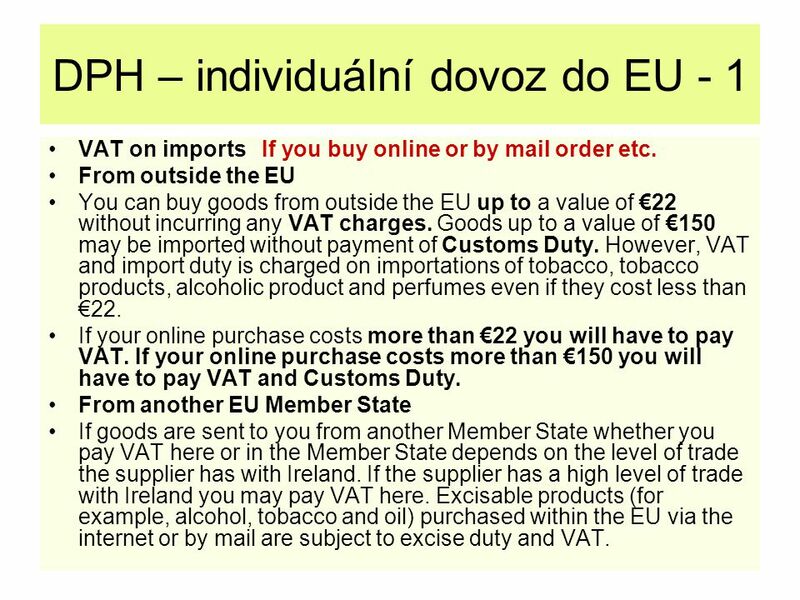 If your online purchase costs more than €22 you will have to pay VAT. 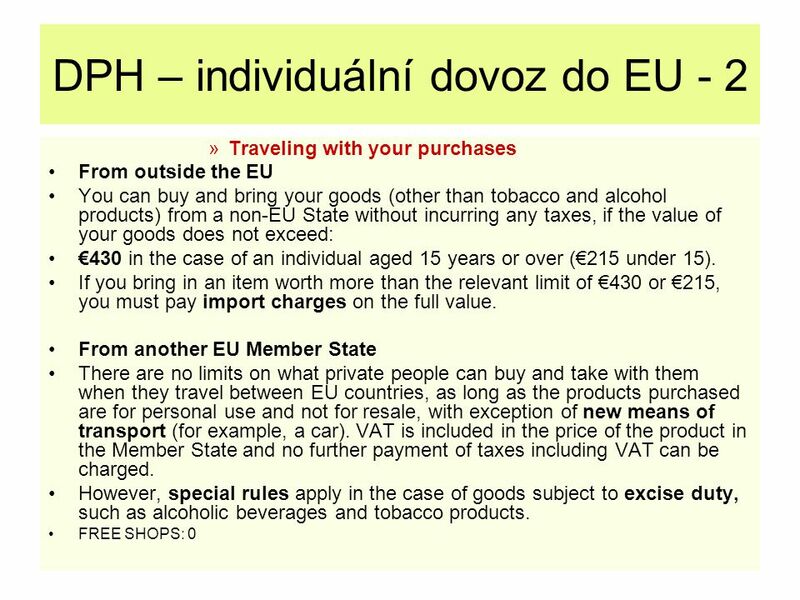 If your online purchase costs more than €150 you will have to pay VAT and Customs Duty. From another EU Member State If goods are sent to you from another Member State whether you pay VAT here or in the Member State depends on the level of trade the supplier has with Ireland. If the supplier has a high level of trade with Ireland you may pay VAT here. Excisable products (for example, alcohol, tobacco and oil) purchased within the EU via the internet or by mail are subject to excise duty and VAT. 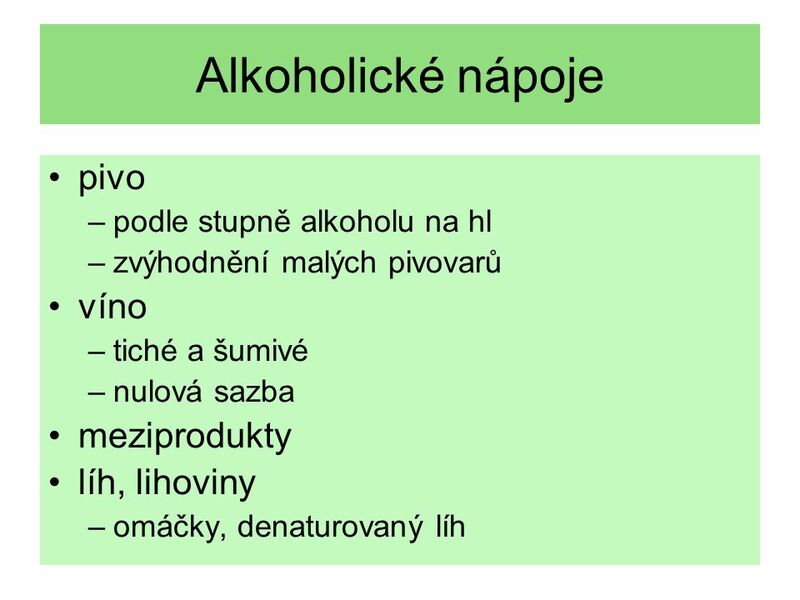 Stáhnout ppt "Harmonizace nepřímých daní v EU"
Modal Verbs = způsobová slovesa.